In the last installment of “Give yourself a hand”, we looked at the anatomy, general function, and exercises for the forearm and the wrist. As you may recall, the forearm and wrist help to position the hand properly. Now, we’ll look at the structure and function of the hand more closely. 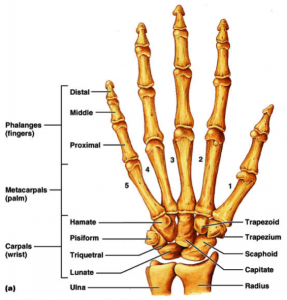 In the human hand, there are 5 metacarpal bones that link the wrist bones (carpals) to the 14 bones that make up the phalanges; the fingers and the thumb. The hand has an extraordinary ability to manipulate and grasp objects as well as the fine motor control and delicacy to pluck a guitar string or pick up a pebble. One interesting thing to note is that the phalanges do not contain any muscles; all the movements in the tips of the fingers are executed by tendons that run from the fingertips to the palm side of the hand, up past the carpal tunnel, and into the forearm, where they attach to the muscles that control them. There are also shorter muscles located in the palm or metacarpal portion of the hand that control hand and finger motions that require dexterity. There are 34 individual muscles that control the movement of the thumb and fingers, 17 are in the palm, and 18 of them are in the forearm. Some of these muscles are very strong; for some elite mountain climbers, these muscles help them scale vertical rock faces with just their fingers. The unique arrangement of tendons, bones and muscles allows for humans to have varying types of grasps. We can narrow it down to two basic grips: the power grip, and the precision grip. In a power grip, an object is held by partially flexed fingers against the palm of the hand with counter pressure applied by the thumb. This type of grasp often requires a high amount of muscular force. We use a power grip when we open a jar of pickles, throw a ball, lift dumbbells at the gym, and carry a bag or briefcase. 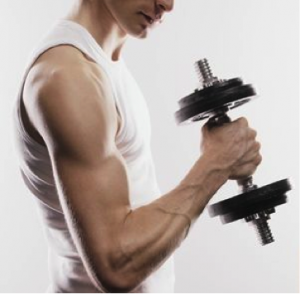 The power grip requires a static contraction of the finger, hand and forearm muscles. The precision grip occurs when an object is held or manipulated only between the fingers and the thumb, and does not come in contact with the palm. This grip requires less power and more muscle fine tuning than the power grip. 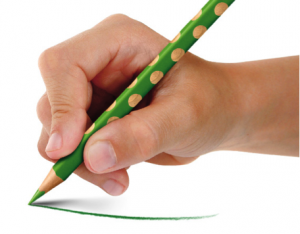 We use a precision grip when writing with a pencil, using a pair of tweezers, gripping a key to open a door, turning the page of a book, fastening a button, and pulling out a bill from our wallet. The movements of the fingers are controlled by 2 groups of muscles: extrinsic hand muscles and intrinsic hand muscles. 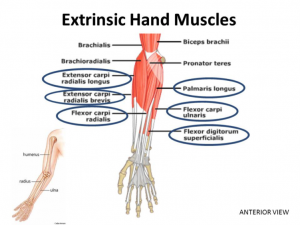 The extrinsic hand muscles are actually not located in the hand at all; they come from the forearm and elbow. These muscles have very long, thin tendons and serve to bend and straighten the wrist, and those of the last two joints of the fingers. For the fingers to be able to contract along the palmar side of the hand in order to grasp an object, the wrist joint must first be stabilized by the wrist extensor muscles. If this critical step did not occur, the wrist would be flexed at the same time as the fingers, and gripping would not occur. The extrinsic hand muscles can only pull the finger into flexion or extension. They cannot pull the fingers laterally or medially or diagonally across the palm of the hand; those are the functions of the intrinsic hand muscles. The intrinsic muscles of the hand are all located in the front and back of the hand, from the wrist to the knuckles (the metacarpal portion of the hand). These short muscles are responsible for more precise motions of the fingers specifically, and do not move the wrist. The interosseous muscles open and close the fingers of the hand, as in spreading the fingers apart (like when you are about to catch a big ball) and close the fingers together again (like slipping your hand into a tight mitten). The lumbricals bend your fingers specifically at the metacarpal phalangeal joints. And there are several other little muscles that serve to move your pinky finger or you thumb across to the other side of the hand for various gripping motions. Various conditions can affect hand function. Arthritis is a common hand and wrist ailment. Both rheumatoid and osteoarthritis affect the joints of the hand and wrist and can have a big impact on hand function because of the resulting pain, decreased mobility and joint deformities. Other soft tissues in the hand can also be negatively affected by tendon, joint and bone injuries due to fractures, overuse, trauma or surgery. 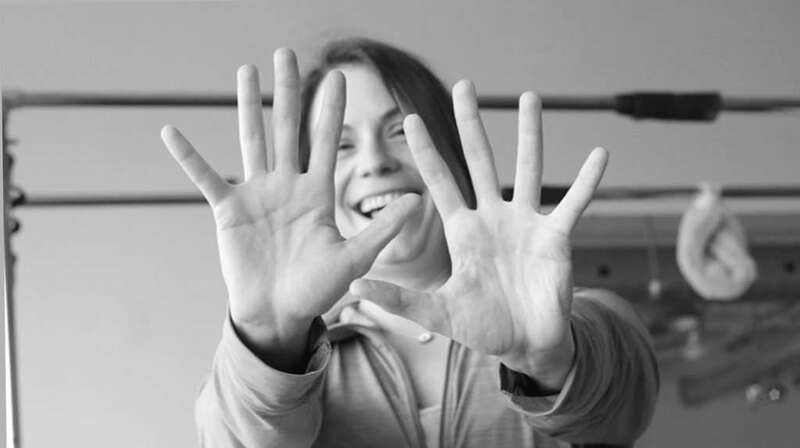 In next week’s installment, we will look at some simple but effective exercises to strengthen and mobilize the structures of the hands and wrist.